Six of the top 30 Chicago Cubs prospects (as ranked by Baseball America) are assigned to South Bend to start the season, including the Cubs’ top pitching prospect, right-hander Dylan Cease. Cease is ranked the fourth-best prospect in the Cubs organization, behind three former Midwest League outfielders: Eloy Jimenez (2016 South Bend Cubs and last year’s Midwest League MVP and Prospect of the Year), 2017 spring training standout Ian Happ (2015 South Bend Cubs) and current Chicago Cubs centerfielder Albert Almora (2013 Kane County Cougars). Baseball America says Cease has the best fastball in the Cubs system, reportedly hitting 103 mph in extended spring training. He posted a 2.22 ERA with 66 strikeouts and 25 walks in 45 innings/12 starts for the short-season Eugene Emeralds last year. South Bend is the 21-year-old hurler’s first full-season assignment, three years after undergoing Tommy John surgery his senior year in high school. RHP Erling Moreno (No. 20) — another Cubs pitching prospect who had Tommy John surgery — joins Cease, LHP Manuel Rondon, and right-handers Tyson Miller and Duncan Robinson in the starting rotation. In six starts (30 IP) for Eugene last season, Moreno posted a stellar 0.90 ERA with 22 strikeouts and five walks. 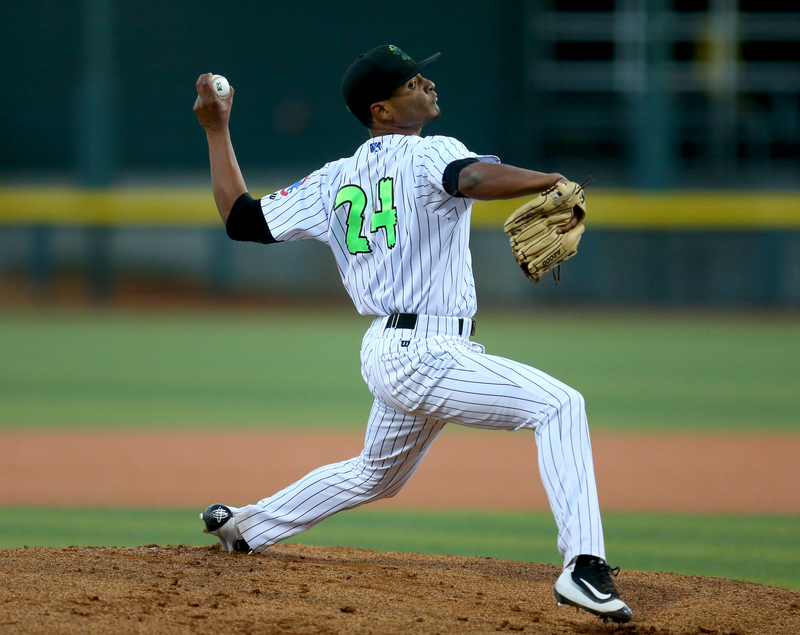 Rondon made 12 starts for the Emeralds, going 6-1 with a 1.10 ERA, 49 strikeouts and 22 walks in 57.1 innings. South Bend also starts the season with a quartet of position players who rank among the Cubs’ top 30 prospects: outfielders D.J. Wilson (No. 9) and Chris Pieters (No. 30) and infielders Wladimir Galindo (No. 18) and Isaac Paredes (No. 29). The first three played for Eugene last year, while Paredes spent most of last season in the rookie-level Arizona League. The two infielders in particular were impressive at the plate last season. Paredes batted .305 with 26 RBI in 47 AZL games before playing three regular-season and three postseason games for South Bend. Galindo was Eugene’s biggest bopper last year, leading the team with 9 HR and 40 RBI in 66 games. Wilson and Pieters posted similar numbers for Eugene in the main statistical categories last season. Wilson batted .257 with 3 HR, 29 RBI and a team-best 21 stolen bases in 64 games. Pieters had one less stolen base to go with 3 HR and 30 RBI in 66 games. They are joined in the outfield by Kevonte Mitchell, who batted .245 with 5 HR, 27 RBI and 16 SB in 62 games with Eugene last season. You can see the entire South Bend Cubs roster here. Last year’s Midwest League Manager of the Year, Jimmy Gonzalez, is back as skipper of the team. You can read about him and his coaching staff here. This entry was posted in Eugene Emeralds, Kane County Cougars, Midwest League, Northwest League, South Bend Silver Hawks. Bookmark the permalink.